Set with a modified pear-shaped fancy vivid blue diamond weighing 12.02 carats to the tapered baguette-cut shoulders and 18k white gold hoop. With certificate 11568233 dated 19 June 2001 from the Gemological Institute of America stating that the diamond is fancy vivid blue, natural color, VVS2 clarity. 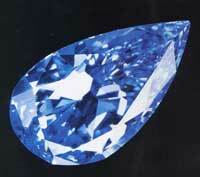 Historically, blue diamonds originated from the Kollur mines near Golconda in the Indian state of Hyderabad. It is here that historically important stones such as the Hope Diamond and the Tereschenko were mined. Most of what is known about early mining activity in India comes through the 17th century traveler and one of the premier gem-merchants of his time, Jean-Baptiste Tavernier. 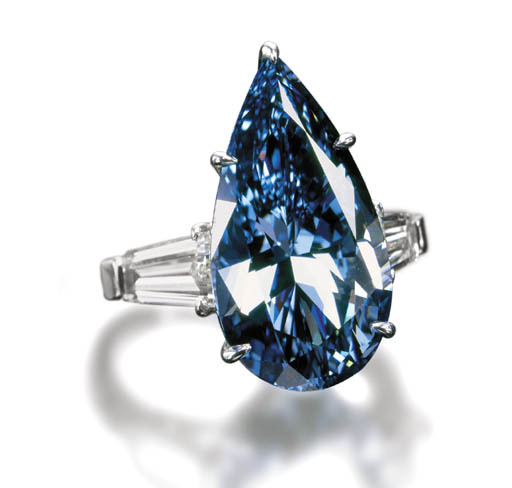 His main client was Louis XIV and it is known that he sold to the King a very large blue diamond known as the French Blue which is thought to have yielded the Hope; it is here that the history of blue diamonds began. These Indian deposits have now been worked out and so nearly all the blue diamonds that now appear on the market come from the Premier Mine near Pretoria in South Africa. Natural blue diamonds are amoung the rarest of colored diamonds and their color comes from the presence of minute amounts of the element boron incorporated within the crystal lattice of the stone during its crystalization process. They belong to the extremely rare Type IIB category of diamonds and are semi-conductors of electricity; an attribute which makes them unique amongst other diamonds. The pear-shaped diamond of 12.02 carats offered here is part of a very elite group of remarkable blue diamonds offered at auction and has been awarded the highest color grade of VIVID by the GIA. Furthermore it is to date the largest vivid blue diamond to appear at auction making it a highly rare and collectible gem." The stone did not sell. Christies was predicting it to go for between $5,000,000 and $6,000,000 U.S. dollars. I contacted Christie's and asked them about the stone, they told me that the owner does not plan to put it back up for auction in the foreseeable future. The Blue Magic out of its 18K white gold ring setting. The gem measures 21.42 × 11.61 × 7.76 mm.